I’ve been fascinated with a reality show called The Pitch on AMC. I can't help myself. Probably because it reminds me of the earlier part of my career when I worked at an agency, and also because it’s exactly how agencies run, how the pitch process works, and how decisions are made. The basic premise of the show is simple. Two advertising agencies go head-to-head to win the business of the episode’s featured client. The two agencies are followed from the day of the brief to the day they present their work with plenty of drama in between. A winning agency is selected in each episode. What struck me most about the show was the focus on creativity rather than strategy. It may be in part due to editing, but the briefs seemed generic, lacking strategy and buyer insights. What position are they taking in the marketplace? How did they arrive at this position? And how is this position different from the competition? What business objectives are they trying to realize? Who are their target markets, and what is the buying process? 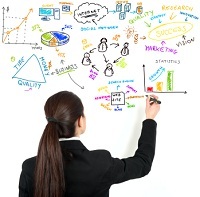 What market research was conducted to yield meaningful customer/prospect insights? It’s very easy to get caught up in the creative: the bold, visual graphics; the tagline; ads, and so forth. Creative is tangible. We can wrap our minds around it, because we can see it. But that doesn’t mean it delivers on the strategy. If your B2B company is eager to refresh its image with a new creative direction, take a step back and first ask if you have a strategy. And if not, here are four reasons why B2B companies need a marketing strategy before undertaking marketing execution. For more information on our B2B marketing services, please call 416-598-4684 and speak with Lisa Shepherd. Or, sign up for our emails here to get regular updates on B2B marketing tips, trends and best practices.